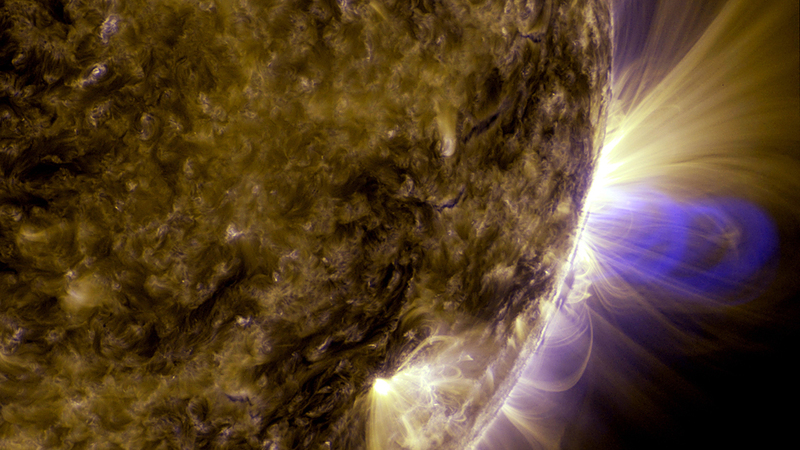 Magnetic loops on the sun, captured by NASA's Solar Dynamics Observatory. Research by Siberian scientists gives credence to the long-held popular notion that the Earth's magnetic field can influence a person's psychological and physical state. Scientists at Tomsk State University (TSU) are studying how magnetic storms impact human health, as well as the functioning of different electronic devices, and the Earth's ecology. These storms, which can last from several hours to several days, occur when the Earth's geomagnetic field reacts to solar rays. Over the past year, TSU scientists studied 60 people of various ages, and confirmed that magnetic storms impact hearing and vision, slowing reaction time. A special technique proposed by the Crimean Federal University and the Institute of Space Research was utilized. "We conducted more than 350 observations," said Yulia Afanasyeva, a specialist in the field of space physics and ecology at TSU, in an interview with RBTH. "Quiet geomagnetic activity was chosen as the background conditions, and for comparison, the experiments were carried out during days of high activity. As a result, it became clear that increased geomagnetic activity extended a person's reaction time to stimuli." The results differed depending on the subject's age; reactions slowed most among volunteers over 50 years old than among younger ones. To determine the severity of a storm, researchers used a power scale of 0 to 8, where 0 is the calmest and 8 is an extreme geomagnetic storm. Scientists recorded a significant change in reaction time during a storm over four points, and experts call such abrupt changes, "a small storm." Slower reactions may partly explain the increase in the number of traffic accidents, work-related injuries, and other man-made accidents during periods of geomagnetic disturbance. The human condition, however, can be influenced not only by sudden fluctuations of Earth's geomagnetic field caused by solar flares. Another research project at TSU shows how the brain's electrical activity changes during natural local magnetic anomalies. Environmental magnetic fields impact the functioning of many life forms, for example, helping birds to navigate. Natural geomagnetic anomalies influence the human condition as well; for example, the nervous system is particularly vulnerable to the influence of magnetic fields. TSU scientists conducted a series of experiments on the magnetic field in the Altai Mountains, near the district center of Kosh-Agach where in 2003 there was the epicenter of a very strong earthquake (8.5 on the Richter scale). "Volunteers were studied both in the natural conditions of the base camp and in the anomalous zone," Sokolov said. "During their movement we used mobile sensors to monitor the brain's electrical activity." The Altai experiments show that indicators of bioelectrical activity in the human brain change considerably when entering an area with a disturbed magnetic field. Electrical pulses are used to transmit signals between brain neurons, and violations of this process are reflected in one's health. However, people do not experience any unusual sensations, and generally do not notice anything. The impact of geomagnetic anomalies varies for people of different ages. The electric activity of the brain changes after four or five minutes among young people, while for the elderly it's about one minute. In this case, the reactions are similar to those during magnetic storms.